Home > Trade Show Information > Which Booth Location is Perfect For Your Company? 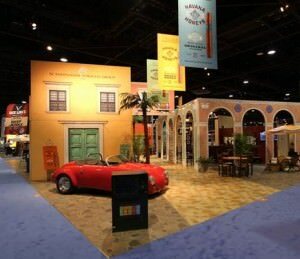 As Trade Shows continue to advance, booths remain a top priority for all exhibitors. If you need a space for your organization or company, use these tips to help you pick the best booth for your specific needs. One of the first things you need to do when selecting a booth is determine the layout and floorplan of the given Trade Show you plan to attend. Some spaces will have pillars, low ceilings, and other oddities that you may have plan for. Also, you will need to find out the particulars, such as the priority points and if the show itself has any restrictions. Even after doing your research, you should reach out to friends, colleagues, and sales reps that have attended the given event to find out their feedback. Things like traffic flow and difficulties with the venue may not be the easiest thing to find when researching, and many of these facts are spread by word-of-mouth. Non-Exhibiting Spaces: Make note of the kiosks, bathrooms, food court, ect. Determine if it would benefit you to be close or far away from these spots. Where Are Your Competitors? Making sure that you know where your competitors are can be very beneficial. You want to make sure that you stand out to your audience. Some people, knowing they have a grand presentation and presence, will choose a location close to their competitors so that they attract the most people. However, you may choose a location further away from your competitors to attract customers and to set yourself apart from them. Avoid Bad Neighbors: Even if these people are not your competitors, make note of who can be a distraction. If you know a specific exhibitor is known to have loud or distracting presentations, try not to be in close proximity. Pick More Than One Location: While everyone’s strategy may vary, it is more than likely that someone else will want your number one choice spot that you have selcted. If you can get it, it’s your lucky day! With that in mind, it is wise to pick 3-5 locations and send in the list or have the list handy when you speak to the event’s salesperson. At the end of the day, any booth can be successful at a Trade Show. If you have a great staff, marketing, product, and booth, there is a high chance of success. For help finding the right booth for your needs or for any other information regarding Trade Shows, please do not hesitate to contact the Eyekon Group at 888-864-4908.